We thought this would be just another house tour. We certainly didn’t think our tour guide would be so full of enthusiasm and obscure facts that he really brought Ernest Hemingway and his wife Pauline practically to life. As a gifted writer and general bon vivant Hemingway is already a rich character to work with, but our guide’s narrative was so rich and authentic it was like taking a time capsule to the 1930s. Plan to spend about an hour here, and since there is no air conditioning you might want to take a hand fan on a warm, humid day. 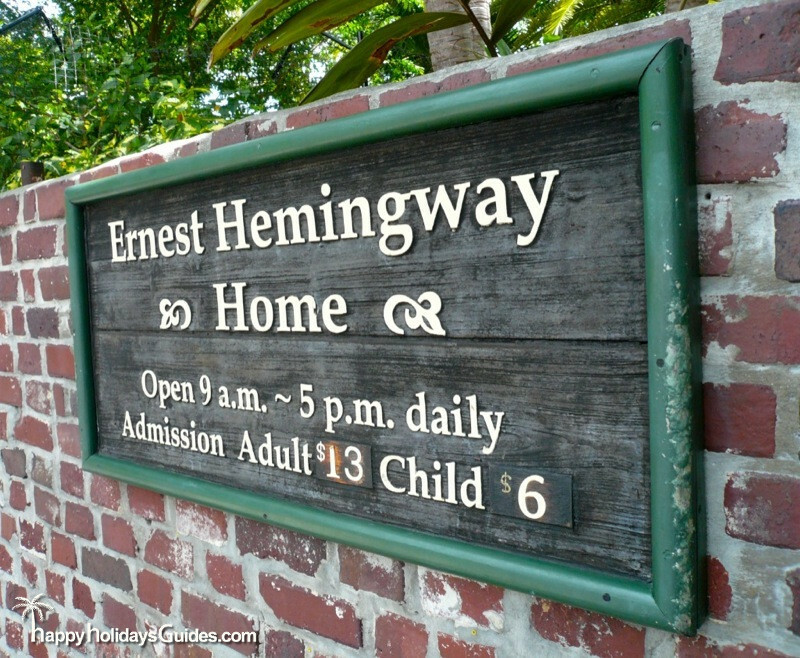 The Ernest Hemingway House and Museum is located on the corner of Whitehead St and Charleston Blvd in Key West. Constructed in 1851, this was the writer’s home for eight years beginning in 1931, and has been declared a National Historic Landmark. Guests and visitors are not allowed on the furniture — that is strictly feline domain! 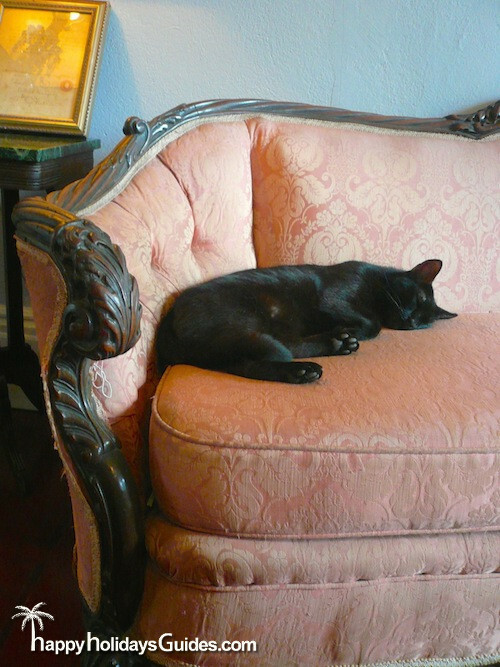 Not even 20 noisy people milling about the room could disturb this dreaming kitty’s cat nap. Could you just kill for that oven? 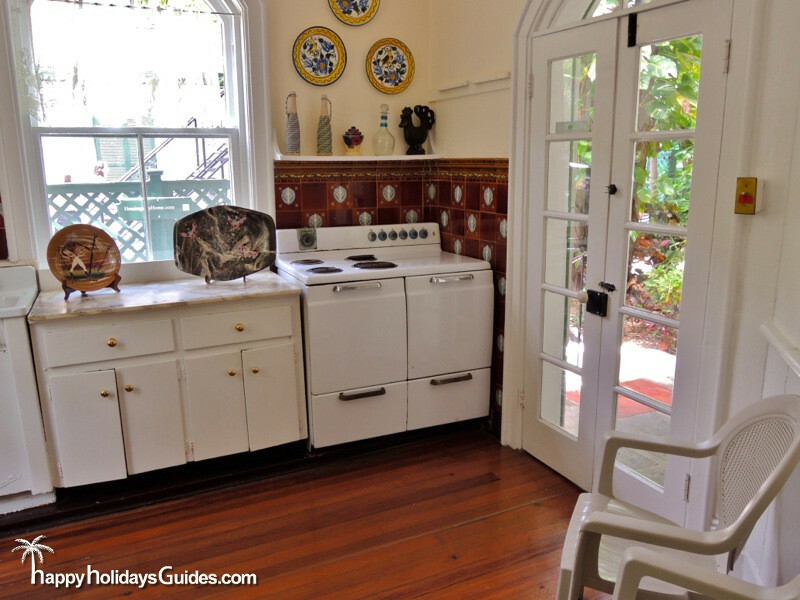 A far cry from the modern open/living/dining kitchen layouts, this kitchen is cozy, bright, and full of charm. 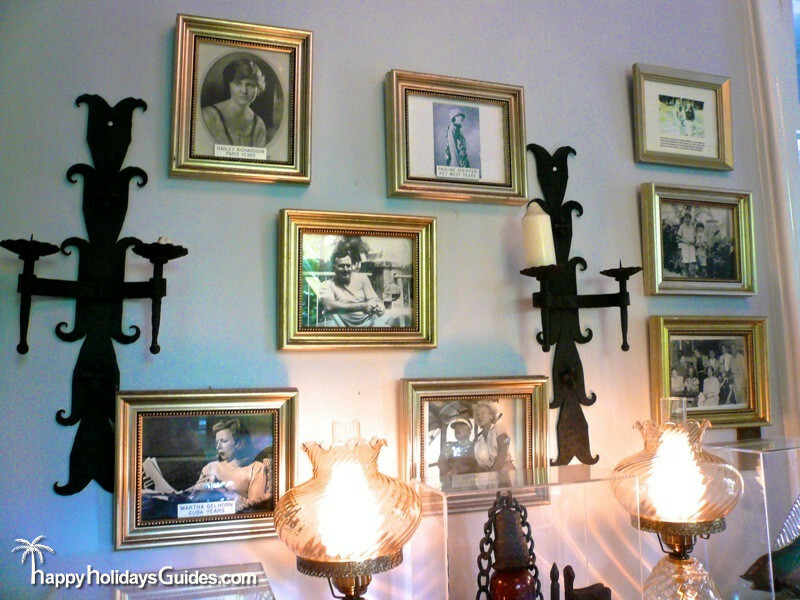 Your tour guide will explain to you how these photos document some of Hemingway’s adventures and business partners/sometimes lovers. 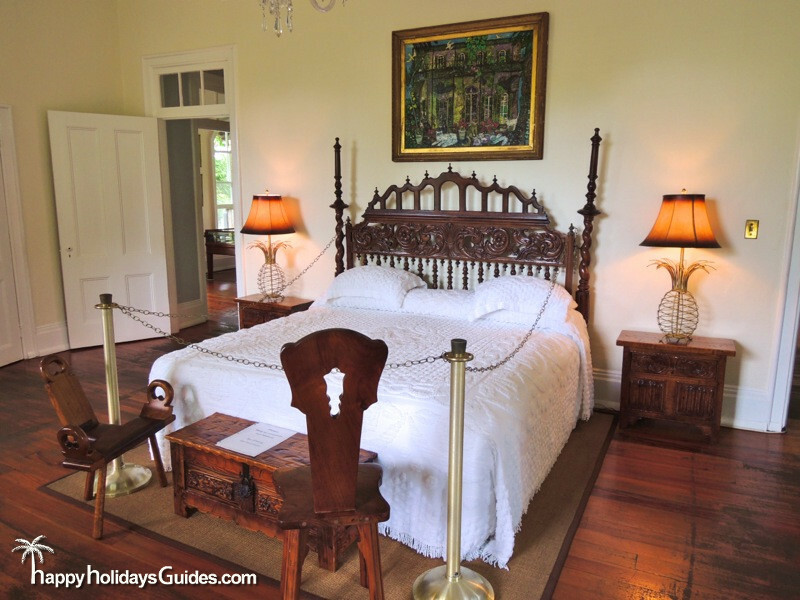 Of special note are the artifacts throughout the home which are under plexiglass to preserve their original condition. 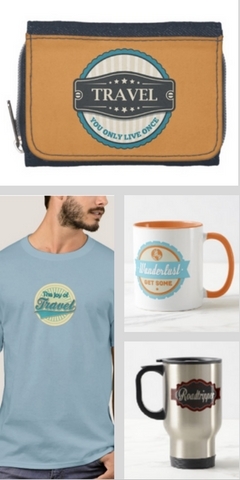 With Hemingway a traveler and adventurer at heart, some of them come from far-off places. Pineapple lamps flank this modest but intricately carved antique bed. Nowhere near the expanse of today’s king-size mattresses, this reminds us of a time when smaller was both elegant and enough. 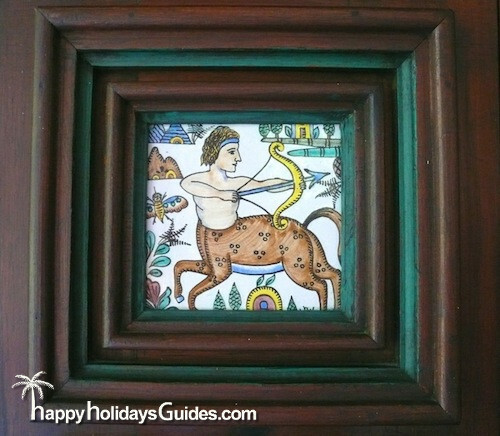 Throughout the home, you will notice striking details like this hand-painted centaur adorning a multi-drawer antique dresser. 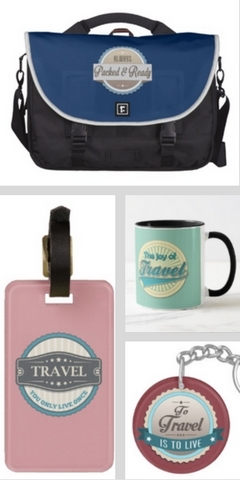 Hemingway was a man of opinions and means, and you definitely get the impression that every piece in the home was deliberately and carefully chosen. The stark art-deco tiles in the master bathroom were imported from Paris, and are the room’s centerpiece. 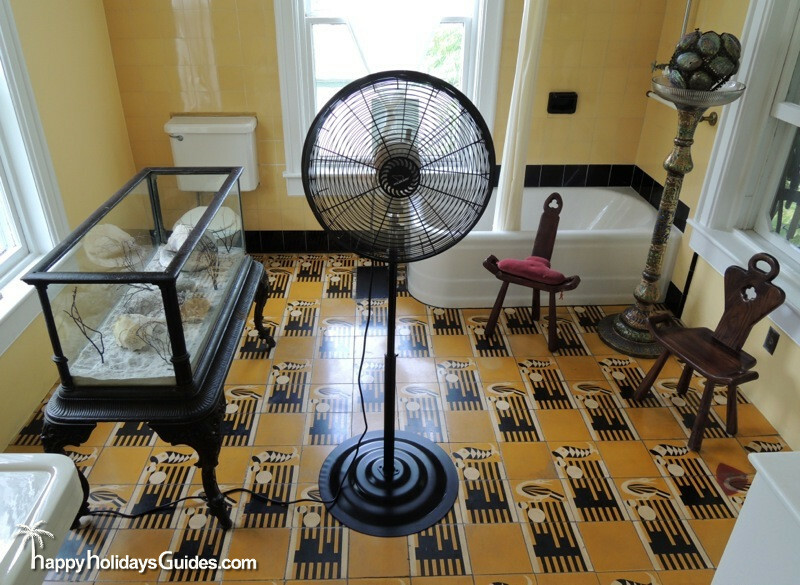 Because the home was constructed before modern air-conditioning — it was in fact the first home in Key West to have running water on the second floor — the wards keep an oscillating fan to keep a breeze going during humid days. 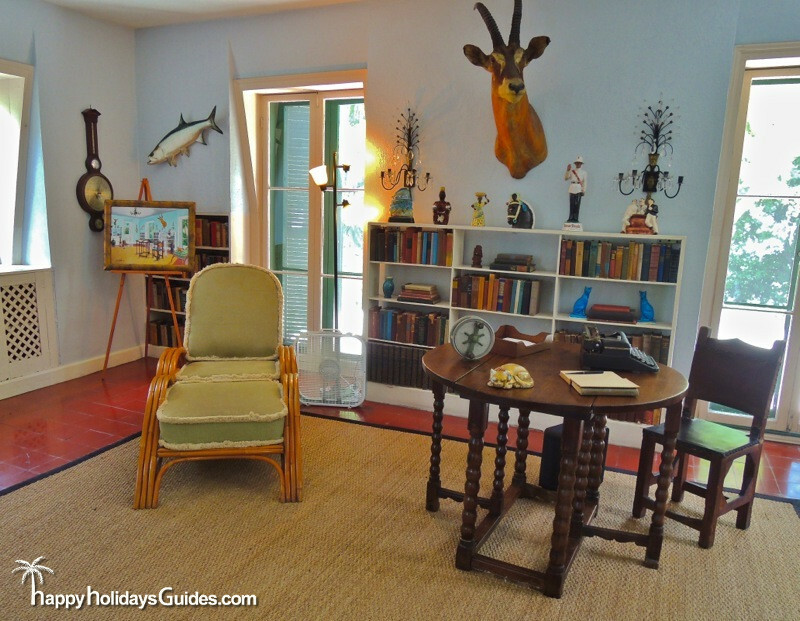 On the second floor of a nearby outbuilding is Hemingway’s modest, cozy, eclectic writing studio. A collection of personal effects and inspiring artifacts, it’s intriguing to imagine how much genius was born in this simple cottage. 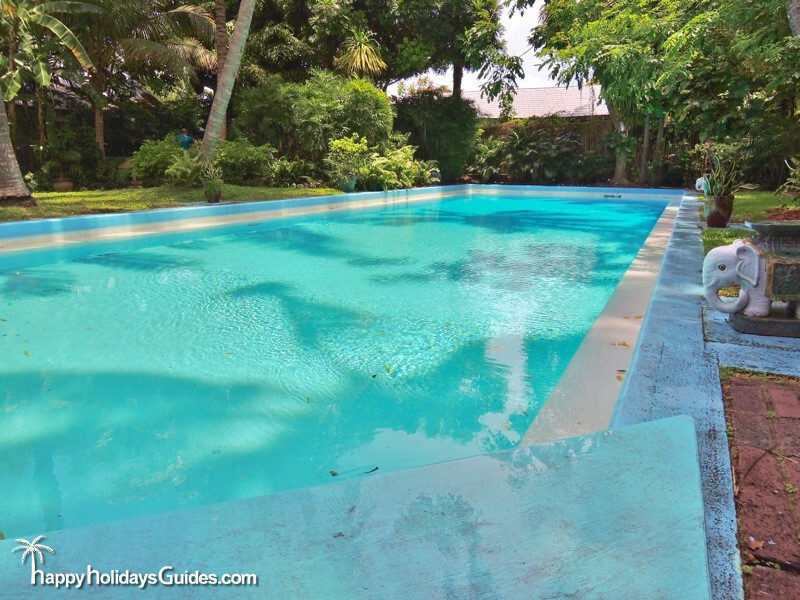 On one of Hemingway’s various trips overseas, his wife Pauline spent a large sum of money to have this pool constructed without his consent. They broke ground and built in the exact spot that Hemingway used to like to engage in friendly boxing matches with his peers. On his return, Hemingway was furious with her and invited her to spend his last red cent, and a penny is – to this day – epoxied into the concrete by the pool as a token of her transgression. Once popular with sailors as mouse-control and good luck, polydactyl cats (literally “many-toed”) exhibit a genetic anomaly with their big mitten paws. Some have theorized that the extra claws offer the cats a mousing advantage and it seems this trait has arisen from multiple sources/locations. 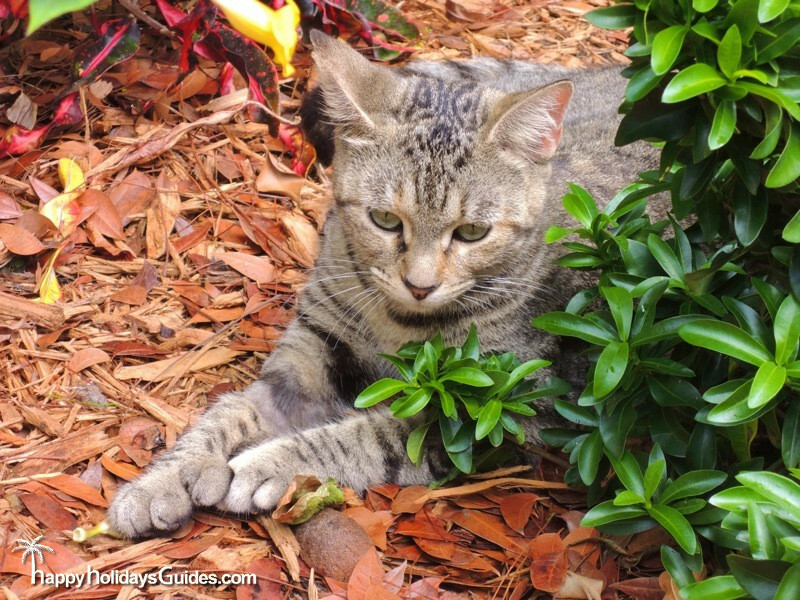 It’s kind of a genetic puzzler but one thing is certain: polydactyl cats kept Hemingway company, and dozens of generations later his polydactly kitties still roam the premises. 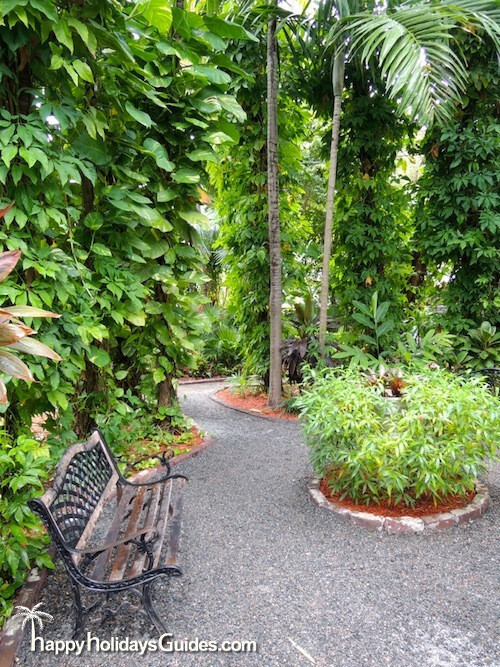 We would strongly encourage you to roam and explore the beautiful flora on the grounds. 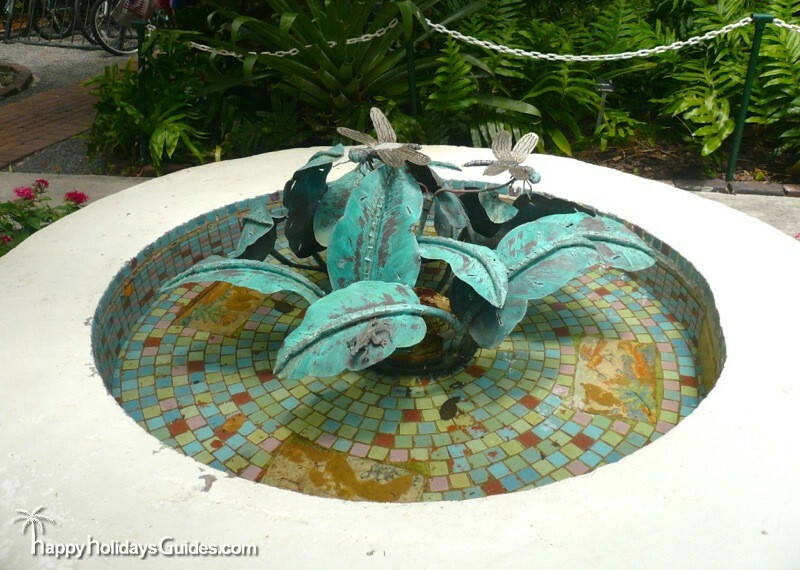 From palm and banana trees to pond lily lotuses you will find a landscape inspired by Hemingway’s many trips to Cuba.